What are your favourite winter activites in Kananaskis? As we drove out to Sandy McNabb this afternoon to check the condition of the ice on the Sheep River, my thoughts drifted to snowshoeing and cross country skiing – my two favourite winter activities. Of course I realize there are lots of other winter activies. I know back-country skiers, snowboarders and ice climbers. And in warm, dry weather like the current weather pattern, winter hiking is popular. But these are all back country activities. Now I have to admit, I don’t use the front country facilities in K-Country much. It was early afternoon when we pulled in to Sandy McNabb day use area – a time of day that usually finds me far from the trailhead. It was a hive of activity! People were skating and some were sliding down the hill. Families were gathered around picnic tables and campfires. It was great to see. 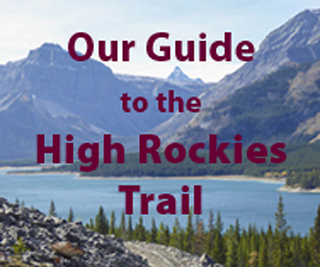 Sometimes we need to be reminded of the many diverse opportunites Kananaskis has to offer. Oh…yes, I almost forgot. The ice on the Sheep River is holding up nicely, making for an easy crossing to the south side and access to Wolf Creek and Price Camp trails. Snow on that side ranged from ankle deep to almost knee deep. The trails are well packed – at least the short distance we did, so hiking should also be possible.